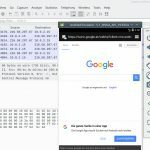 It might be interesting for several reasons to monitor the network traffic of Android devices to watch the network behavior of some apps. This article describes how to monitor network traffic running the Android AVD Emulator on Linux. 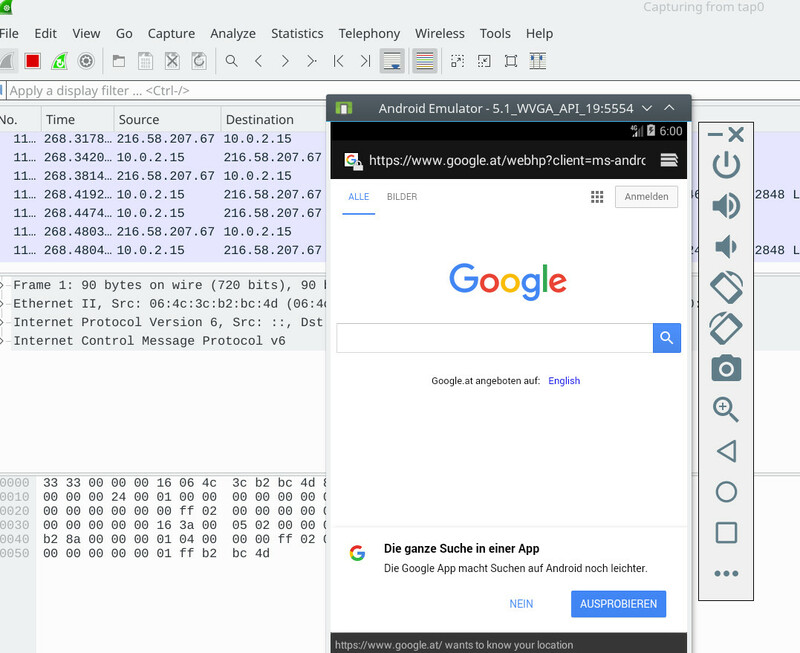 The AVD emulator is part of Android Studio which is Google’s Android the development suite. Thus, it is a prerequisite to install it. You can install it into your home directory, e.g. into ~/android. You should set up an environment variable ANDROID_HOME which shall point to the sdk directory, e.g. ANDROID_HOME=/home/foouser/android/android-sdk-linux. Once successfully installed, you can create virtual images. Use the AVD manager which is found either as the command line tool avdmanager or within Android Studio: Tools -> Android -> AVDManager. It is suggested to create an x86-image because it performs much better since it is virtualized and not just emulated. Create your virtual Android image with it. The images are stored in your home directory at ~/.android/avd. The AVD emulator is actually based on qemu which is a great emulation and virtualization tool for Linux. For network traffic we have to run the virtual image from the command line. First try and run the emulator from the command line to see if your image works. The emulator shall start your virtual smartphone. The reason is that the emulator cannot find the shared libraries which are shipped with it in the package. Run the emulator again, iit should work now. Now we have to setup routing and NAT that the virtual machine is able to access the Internet (you can skip this if you don’t need Internet). In my example wlan0 is the outgoing network interface of the host computer (the Linux box) and 192.168.2.12 is the IP address of your DNS server (see /etc/resolv.conf). You have to change these values appropriately! Have phun watching the dirty traffic of all those apps! Trying this with an arm Android image and the emulator binaries gives a segmentation fault. It does not seem to allow me to give it anything other than a default qemu user NIC. I would like to only have one guest interface through a bridge and no NAT. Any tips for how I could achieve this? Do you have a recent installation of Android Studio and the emulator? I use this setup very often (Debian Linux, Kernel 4.9) and it works like a charm. Since the emulator connects to the tap device, you could also bridge it directly to the Ethernet with the bridge-utils instead of using iptables and NAT.